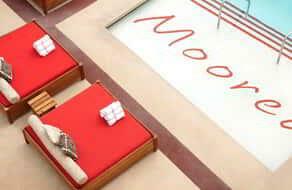 Moorea Beach Club provides guests with a private, adult, upscale and sophisticated dayclub experience. 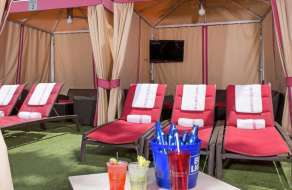 Enjoy European sunbathing with a fantastic view of the beach, cushioned chaise lounges, high-energy music,poolside massage services and the best personalized attendants in Las Vegas. Admission is included in rental fee. Super comfy, and there's room for four. Who gets invited is up to you. Offers a most sophisticated sitting area for daytime lounging. 6-foot day beds centrally located among the excitement of the club. 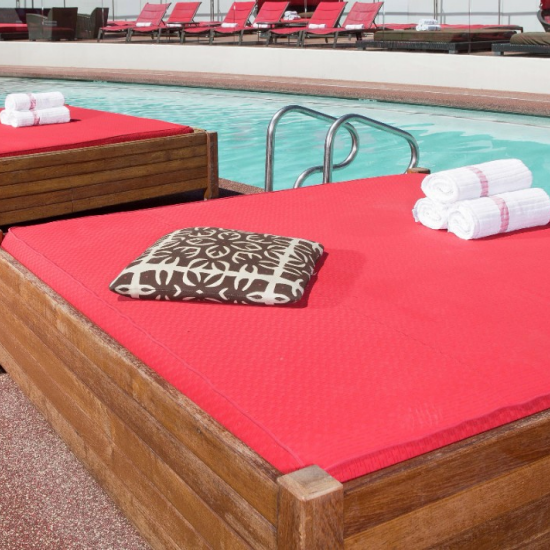 Enjoy the excitement of Moorea Beach Club from your posh, 6-foot day bed. Includes personalized service. Elevated above the main floor, these swank and well-stocked pavilions boast a private pool and lounge area complete with waterfalls. The perfect place to stretch out and take your disco nap. These beach-level cabanas put you in the center of all the action. Located on the 3rd level of our Beach Side Casino building, these villas share a private pool area while each room has its own deck with a spectacular view of Moorea and the 11-acre Mandalay Beach complex. Take the guest elevators down to the beach level and take a right toward Spa Mandalay. Exit the doors and follow the signs to Mandalay Bay Beach. Continue on the path past Mandalay Bay Beach and the entrance to Moorea Beach is on the right. Enter the doorways from the garage area and proceed on cobblestone walkway. Follow pathway as it veers to the right. Take left onto casino floor and follow pathway toward the lobby. Take escalators or guest elevators down to beach level. Turn toward Spa Mandalay. Exit the doors and follow the signs to Mandalay Bay Beach. Continue on the path past Mandalay Bay Beach and the entrance to Moorea Beach is on the right. Open to all ages during the Winter Season. Adverse weather conditions may alter facility times and pool availability.